First Line: It was a Friday in mid-April, warm and clear and spectacularly sunny, and a blizzard was due by midnight. Ever since visiting Santa Fe, New Mexico a couple of years ago, I've found myself wanting to read more mysteries set there. 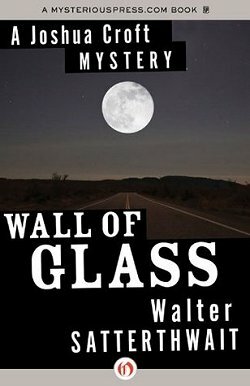 When I came across the first in the Joshua Croft series, Wall of Glass, I remembered enjoying a book he'd written about Lizzie Borden, so I had to give this book a try. I'm glad I did. We don't learn much about Croft's backstory in this book. He's a private investigator working for the Mondragon Agency owned by wheelchair-bound Rita Mondragon. He's approached by a cowboy who wants Croft to fence a stolen necklace worth $100,000. Croft turns him down, and the cowboy is found dead the next day. The insurance company now wants the Mondragon Agency to find the necklace. This involves Croft digging through the backgrounds of the dead cowboy, his associates, and the rich family from whom the necklace was stolen. Of course, he finds skeletons in every closet he pokes his nose into with the requisite danger heightening at every turn. This is a strong mystery with plenty of misdirection, and I certainly did enjoy its New Mexico setting. I also liked Joshua Croft's voice and his sense of humor. I'll definitely be reading more of this series. Now would also be a good time to give a shout-out to Open Road Integrated Media for bringing back so many older, well-written books which certainly deserve a new lease on life. The setting for this one appeals to me, too, Cathy. It's a beautiful town, and I remember (I only visited there once, I admit) feeling a real sense of history there. I'm glad you found a lot to like about this one. I read that same Lizzie Borden book and liked it a lot. And I agree that Open Road is doing us a service by bringing back these books that have (I surmise) been out of print.